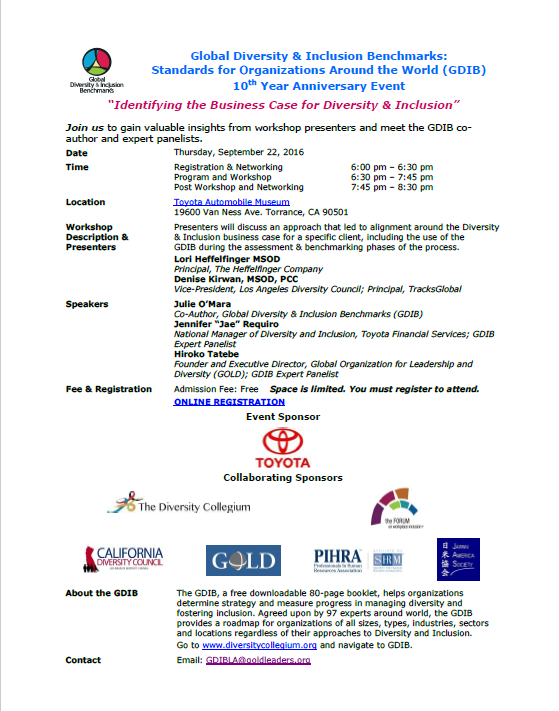 Wherever your organization is in its Diversity and Inclusion (D&I) journey, the Los Angeles Diversity Council can provide support in areas of education, best and next practices, networking and practical application of D&I in the workplace. Our mission is to help organizations better serve the Los Angeles community by providing diversity & inclusion thought leadership, best practices, evidence-based measurement and connection. As a council, we serve as a community-based resource group bringing individual and corporate members together champing D&I at a local level. With a specific focus on D&I, we bring informative education seminars and conferences, a networking environment and communication on how to bring awareness and manifest D&I within the workplace. We build community through our events and activities, provided by the passion for diversity among members of the council. April 9 Talent Management in Diversity & Inclusion: Disability Focused City of Hope @Doubletree Hotel – 11:00 a.m. – 1:30 p.m.
May 14 Generational Diversity Beachbody | Farrington Partners – 11:30 a.m. – 1:30 p.m.